Secretary of the Supreme National Security Council of Iran, Ali Shamkhani says Tehran and Moscow will continue to strengthen the Syrian armed forces in the fight against terrorism within the framework of the existing coalition. Supporting the Syrian government and cooperation with the country to combat terrorism, as well as the preservation of Syria’s territorial integrity and using political mechanisms to let the Syrians determine the future of the country are the goals based on which the political and field victories have been achieved, noted Shamkhani. 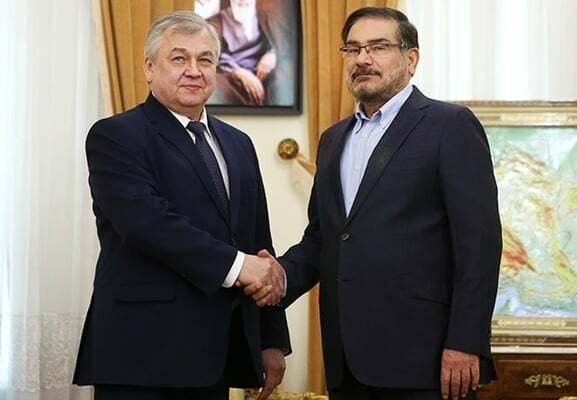 The Iranian official made the comments in a meeting with Russian President’s Special Envoy for Syrian affairs Alexander Lavrentiev in Tehran. Lavrentiev has travelled to the Iranian capital upon the order of President Vladimir Putin to submit a report on the achievements of Istanbul summit. Shamkhani also hailed Russia’s deployment of the S-300 missile defence system to Syria saying that the level of cooperation and common positions of Iran and Russia shows the Zionist regime’s negative role has no impact on the cooperation between the two countries. For his part, Lavrentiev hailed the constructive role of the Islamic Republic of Iran in the political process of building peace in Syria, noting that the Russian Federation has been after enhancement and continuation of the two countries’ political cooperation in Syria until the full establishment of stability and security. He also underlined that the plan to cleanse other areas of terrorists, especially Idlib, will be on top of the joint agenda.